We were introduced to a company that has created wearable technology entirely inspired by the super powers we see in movies. Metron Force™ is based in Silicon Valley. Like many great ideas there, it all started in a garage. The end result is a wearable device coming soon that gives you super hero-like powers. Around three years ago, Alex Lai decided to leave his job at Intel to fully dive into developing this device. Alex found himself still wishing, like he and many of us did as a kid, that he could wield super hero powers. Developing something that can do this would require dedication. He had developed the algorithm used in an Intel product that powered the world’s fastest supercomputer. So, Alex certainly had the talent for it. But, he needed lots of time too. Thus, his decision to focus on it full-time. His garage became his lab and office. But, now there is a fully functional prototype. The wristband is called mForce™. You strap this on and with simple gestures you can control things around you, like super heroes in movies. Metron Force is initially focused on drone applications but, it’s not going to limit you to that. They will offer their BrainReceiver™ too. It’s a plug-and-play board around the size of a quarter. With it, you can convert existing devices to be hacked for control with mForce. The company has already demonstrated doing this with various other devices, from toy robots and motorcycles, to a light bulb, and more. But, back to the company’s drone focus. The current plan is to offer three bundle options that include choices between the mForce wristband, an extra BrainReceiver, a car chassis or drone. With a drone focus in mind, mForce is designed out of the gate to be really good with drones. Here are some of mForce’s distinct capabilities. 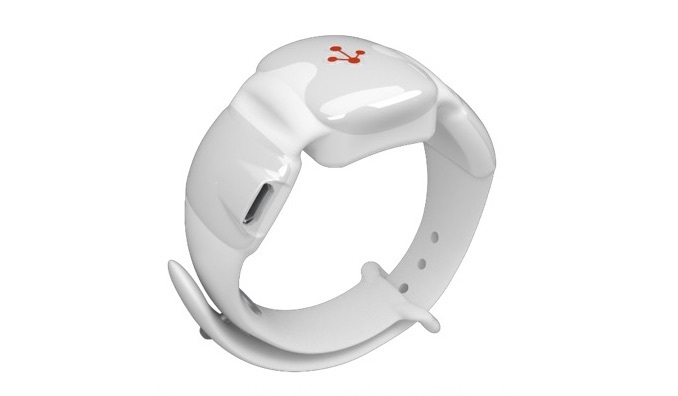 The mForce wristband is the only known wearable technology that can scale device control from one-to-one to one-to-many devices. With just a tap, you can easily switch control between up to six devices. In theory, it can scale to control a thousand devices. Essentially, use of mForce is “what you do, is what you get.” Turn your wrist left, the drone goes left. Bend your arm forward, it goes forward. This intuitive control helps eliminate learning curves for any age. And, there is no noticeable latency. Important drone controls like pitch and yaw are fused within the algorithms. But, drones have another dimension – up and down in the air. As a result, Metron Force is also designing a throttle you can plug into mForce and use with a free thumb. That plug and play BrainReceiver board converts almost any dumb device into a smart device to be controlled with mForce, with no soldering. This includes appliances, theater components, lights in the home, other drones, industrial equipment in a factory, and more. At launch, mForce will offer the smallest-known footprint for a wearable tech device that provides this level of RC gesture control. To bring this force, or mForce, to the masses the company is embarking on some key moments. It is finalizing its own internal testing prior to taking applications to be considered for their beta test program. There will be a limited number of units available for this. Are you interested in being considered to be a beta tester? Then sign up at Metron Force’s website. They will soon provide details on how you can apply. Beta testing is set for this fall. The company will also be considering doing a crowdfunding campaign. So, you will stay informed about helping with that too. Following the company via social channels will also help: @metronforce for Facebook, Instagram and Twitter. The YouTube channel has plenty of demos so you can see mForce in action for yourself.